a spot of whimsy: It's a Date. 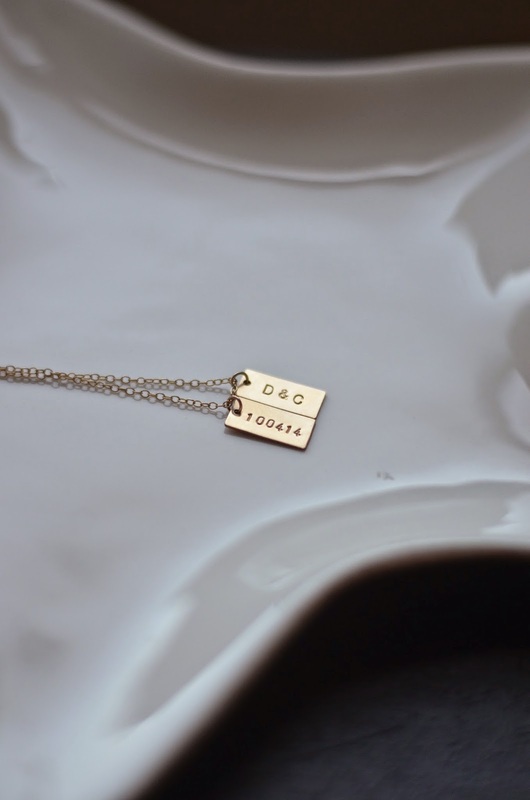 Hello friends, I'm checking back in to say hi and to show you one of the fantastic little items I've come across during my many (probably too many) Pinterest and Etsy wedding searches: Junghwa's Personalized Jewelry (created and designed by Amy Stewart), my favorite being the petite initial tags, pictured here with our initials and wedding date. I tried to hold off on wearing it until our big day in October, but, well, I failed. That's OK, right? Happy Monday, and speaking of important dates - happy 2 year anniversary to my sister and brother-in-law! Cannot believe The Yellow House Wedding was already 2 years ago.